If you use Microsoft Outlook on more than one PC, you're an unlucky soul. Trying to keep your Outlook e-mail synchronized between more than one computer is an exceedingly difficult task, fraught with potential pitfalls, notably overwriting a new version of your e-mail stored in a .pst file with an older version. Syncing.net Home Edition ($150, 30-day free trial, can also be used by small businesses) does an excellent job of solving the problem. When setting up SYNCING.NET, make sure to pay particular attention to whether you want to combine folders from Outlook, or else create new Outlook folders. It automatically synchronizes any changes made to any of your Outlook installations across multiple PCs. Let's say you use Outlook on a laptop and desktop. When you use it on your laptop, it synchronizes the changes back to your desktop in the background. If your desktop isn't running at the moment, it performs the synchronization when you turn it back on. The initial file transfer of an entire large folder from one computer to another can take half an hour or more, depending on the size of the folder. After that, though, synchronization rarely takes more than a few minutes. 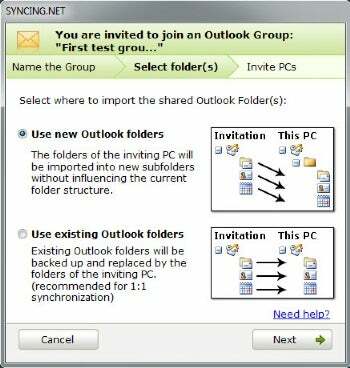 You can choose which Outlook folders you want to synchronize, so that you can synchronize just one or many of them.